Aim: Make a drawing which forces the viewer to use time differently. 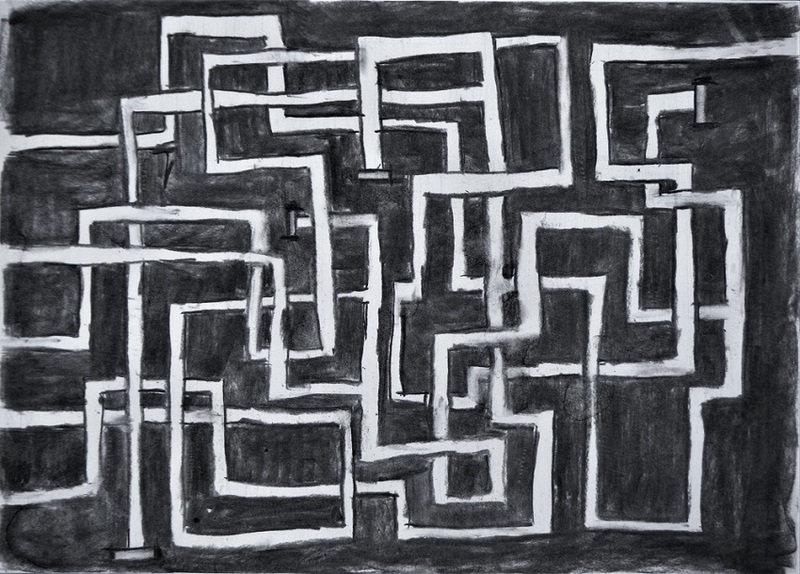 This may mean a drawing which takes time to make sense of, or a drawing that creates a feeling of a certain pace. The drawing may need an investment of time by the viewer in some way. A drawing is a record of the time you spent making it, but the viewer also spends time looking at it, perhaps seeking meaning, enjoying its beauty or marvelling at the artist’s skill. Reflection: Reflect on the time spent by the viewer and how it relates to what you do as an artist. How to make the viewer of an art work use time differently? This was the question I asked myself and after some thought stumbled upon a couple of different ways to do this. One method is to involve the viewer in a process of looking that means they have to spend a time looking, understanding and examining the work in order to comprehend its meaning. Another way is to involve the viewer in a process which involves them in the work and they must complete the looking process, spending to do so in order to complete their viewing experience. To force the viewer to spend time looking at the work you may introduce a narrative that plays out in a process through the work. This is in effect ‘sequential art’. This type of art has been around for some time in the form of comic strips magazines, graphic novels, some artists books, advertising to name but a few. I have illustrated an example of a narrative in an early advertisement for Fry’s Chocolate. This is a form of ‘sequential art’. 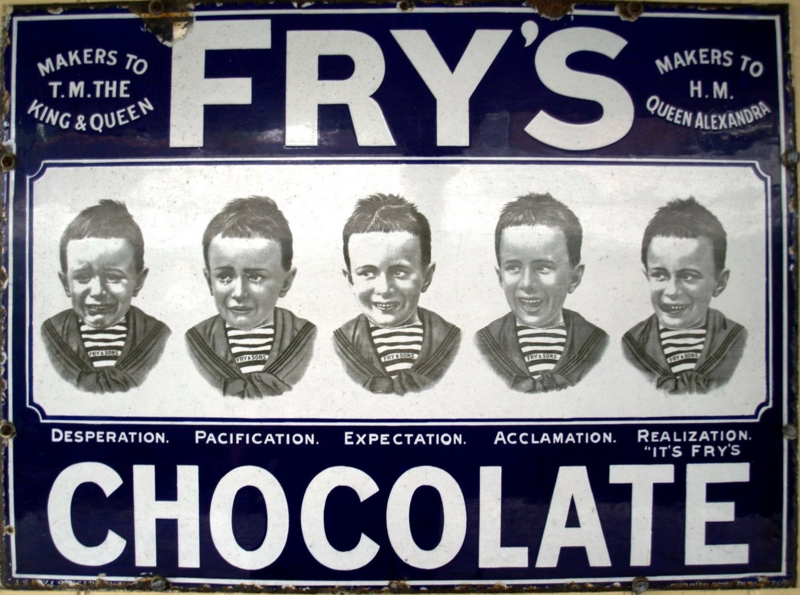 The young boy is pictured in five sets of expression with the single word explanation of his expression below each portrait, all leading of course to the realisation of what he wants, needs and has to have – yes – a bar of chocolate. So the viewer can be forced to stay involved by having to read to the end of the story. Each small element of the picture strip can be in effect a mini-artwork and images along with text can keep the viewer involved. 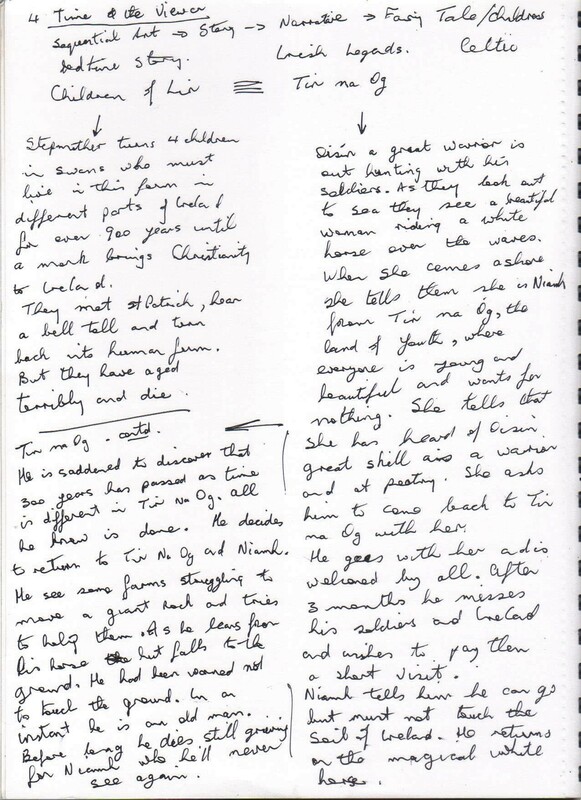 The story itself may play out in real time, slow-motion or over and extended period, such as hundreds of years in the example draw as part of the exercise. Involving the viewer in an exercise in order to fully view the artwork forces the viewer to use time differently or extend their time at the artwork. Using a visual puzzle that must be solved is a means to doing so. 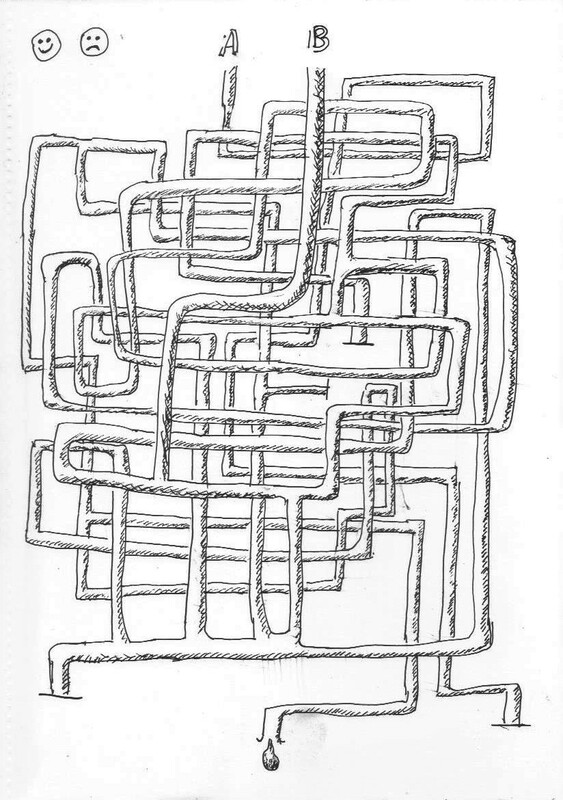 Some artists have used mazes in their art and this has forced their viewers to view and comprehend. 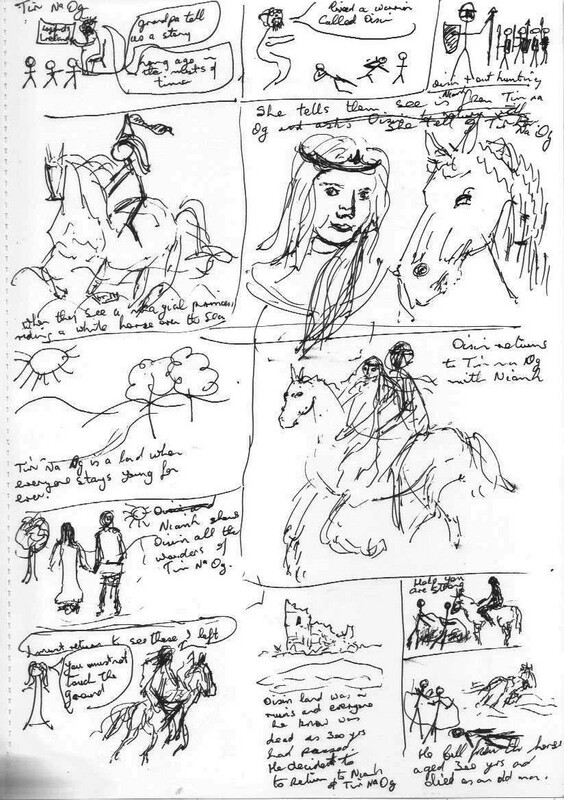 Examples of such works is illustrated below in Figs 2 and 3 by Joe Tilson. 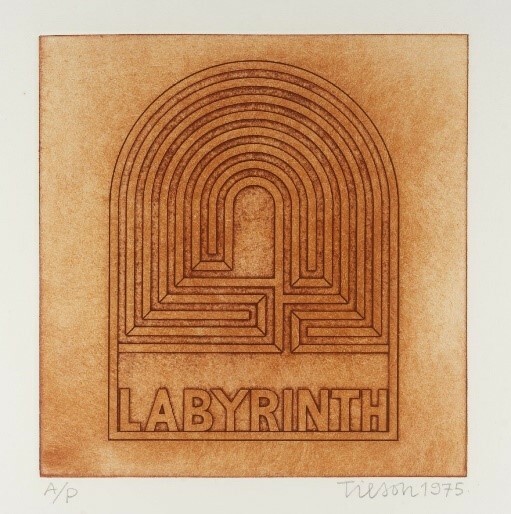 Joe Tilson’s works are not quite puzzles to be solved by them do involve the viewer in tracing the design of the labyrinths he depicts. He uses them as both metaphors and as a design device. The metaphor he is alluding to may be a journey, either in the physical sense of in the metaphysical sense of a mental journey. The journey through life stumbling over life’s obstacles. 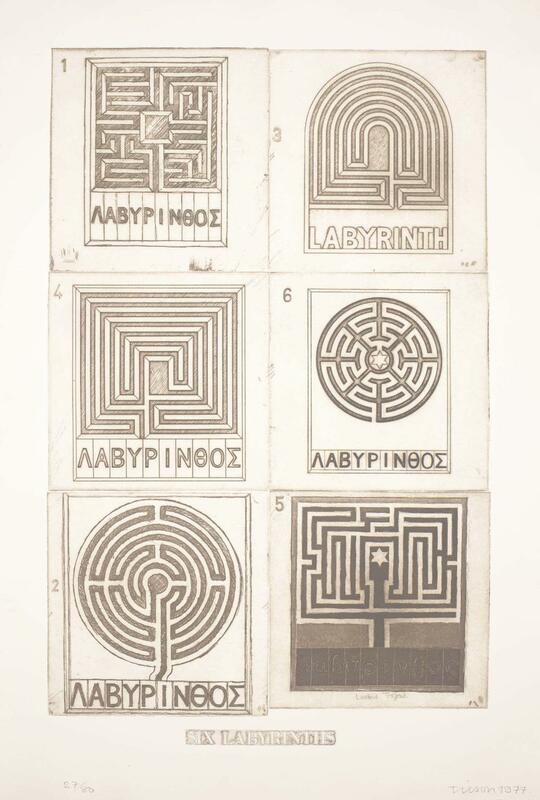 Mazes (labyrinths) have been used in medieval churches in the floor tiles to represent the journey to God. The use of a maze can also be to get lost. Does Tilson wish us to get lost in his maze and end up spending a time there completing how to exit, the route or capture us and allow time for our thoughts to develop to solve any of our life’s riddles. 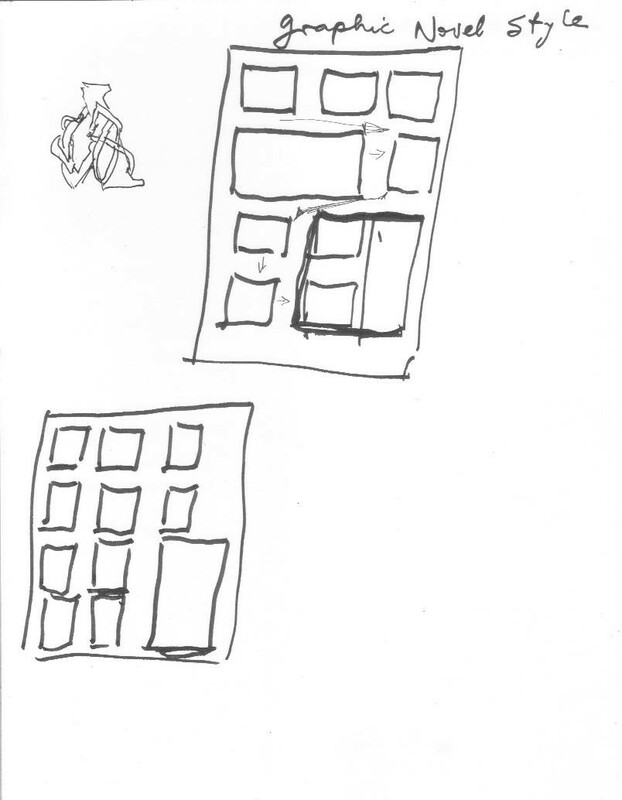 For this exercise I explored a few ideas in the form of sketches and notes. One idea was a maze in the form of a puzzle. Like some puzzle magazines the viewer must solve the maze of pipes to ascertain which is the correct pipe to pour the water down. This was explored as as an A4 sketch in pen and then as an A3 charcoal drawing. Having looked at the work of Stephen Walter I was drawn to the idea of somehow using maps in the piece. 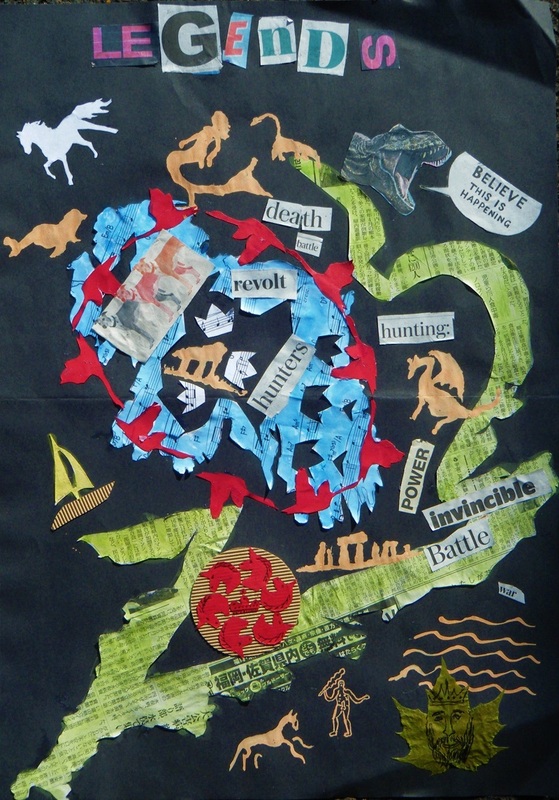 This was explored in as a collage using the concept of ‘Legends’ of the British Isles as the starting point. There are some links and nods to the previous exercise in the map of Alba. Continuing on the theme of legends I noted the brief details of two of the old Irish traditional legends that are know to all in Ireland. 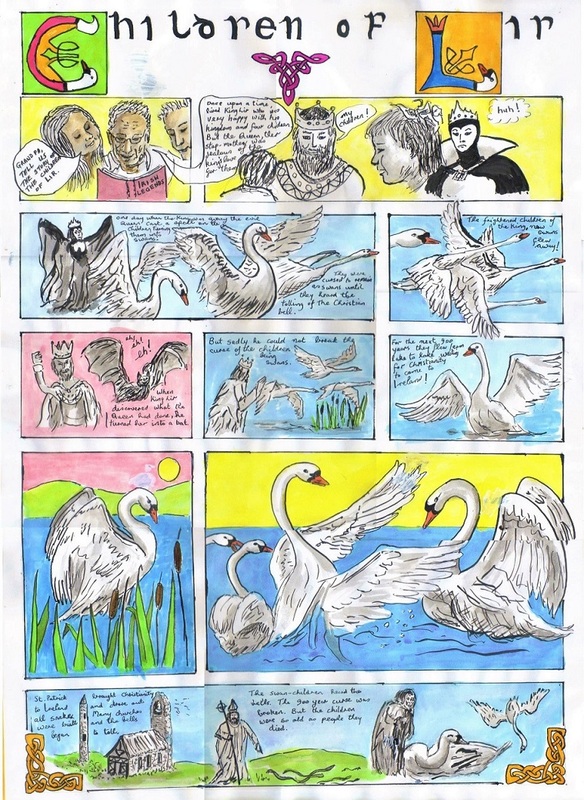 These two stories are from the ancient tales of the Irish Mythological Cycle, a series of myths and legends first written by medieval monks from the oral traditions. 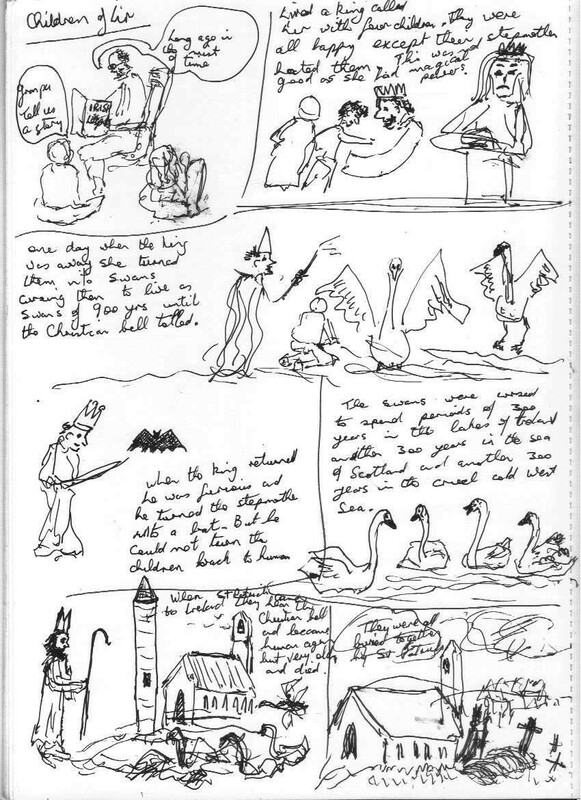 The two stories are ‘Tir na Og’ (Land of the Young) and ‘The Children of Lir’ (from which the ballet Snow Lake was derived). One involved a beautiful lady and a mystical white horse and the other children condemned to spend hundreds of years in the guise of snows after their jealous step-mother cast a spell. Like many Irish tales these don’t have a happy ending. The A2 multi-coloured ink drawing is the end outcome of this train of thought. Using the concept of Sequential Art to set the pace and drive the narrative I made a series of drawings on one side of an A2 sheet. The idea was to involve the viewer of the work in a process of a narrative which they would invest time and read to the end, spending the time to read the text, explore the images and follow the story to its conclusion. I will admit to taking editorial licence to the story both shortening it and amending some details to fit the shortened narrative. This was quite an enjoyable piece to work upon. Exploring another path of the original concept of myths and legends I formulated a collage using pictograms cut-out drawings. The black paper utilises the bright coloured paper and watercolour and ink colours used. In the collage mounted on heavy black paper many of the myths and legends, etc will be familiar to many but some may be obscure Irish or Scottish ones. I have penned a briefing note below of what the various symbols, pictograms and drawings etc allude to in the piece. The text was placed in appropriate places where possible. The power in London with the Kentish undefeated motto (Invictus) below and the Battle of Hastings marked. The standing stones, Stonehenge, with the chalk outlines of Cerne Abbas Giant and Uffington White Horse alongside the Green Man on the sycamore leave. The horse mounted on a roundel represent the Knights of the Round Table and the Arthurian legends. The boat /yacht mid sea represents the seafaring tradition in many guises from the Pilgrim Fathers setting sail, to the Vikings raiding the coasts to the Irish pirates who enslaved St Patrick and brought him across the Irish Sea. with the circle of swans (Children of Lir) a dolmen (one of a couple of hundred in Ireland), the dogs represent the legend of Cuchulainn. The three crowns represent the Kingdom of Munster and the text ‘revolt’ indicating the 1916 rising in Dublin. This short amount of time is about the same amount of time a short TV advert gets to tell potentials customers about a product they usually know all about already. Seems like people race around a gallery trying to see as much art as possible in volume rather than looking, really looking. A movement in the USA has started ‘Slow Art Days’ and this has been embraced by major national institutions such as SFMOMA. In a nutshell this informs the artist that they have only a few seconds to capture and hold the attention of a viewer, and hopefully get them to spend more that the average in front of your work. Thus the artist becomes much like a marketeer aiming to get a hook onto the viewer to hold and entice. There are various devices that artists have used to grab the attention of viewers. Using the ability to shock the viewer is one way to garner attention is one method that has been used extensively in the last 100 years or so. However, most artists will strive to use either subject matter or composition to generate the necessary hook for the viewer. The artist starts with a vision of how the work will look or what he wishes to achieve. They then attempt to capture the essence of their vision on the canvas or paper etc they are working upon. If successful then they will achieve the necessary pulling power to either win or lose the viewer. The viewer being selfish with their time will quickly move on if their attention is not captured. Capturing the viewer is generally a combination of the skill as an artist using interesting marks, colour and composition as well as subject matter to hold and extend the time the viewer spends looking at their work. As well as capturing their attention the artist must then hope that the viewer uses this to understand the work and sees what the artist was trying to convey. In the today’s world there is a multitude of distractions for a viewer from other surrounding stimuli to the phones and other devices, the artist must use their skill to convey what they wish the viewer to see. Today the viewer is usually sophisticated visually but through modern media and devices has essentially been trained to look quickly and move on. So the artist must capture the viewers attention and have sufficient hooks and interest to keep this interest long enough to convey what they wish to convey. It may seem counter-intuitive to say then that the simpler and easier a picture is to understand the more successful the artist may be but the opposite is generally the case. The more complicated the work and involved the viewer must become in understanding and interpreting it the more time a viewer may spend looking at it. For example, say the artist has draw a simple clock face with all the numerals noted and the hands clearly showing the time, then the viewer can quickly determine what the time is. However, if the artist were to leave the numerals absent and partially obscure parts of the hands and clock face then the viewer must spend time and mental energy to ascertain what time it is and what the artist is conveying. What must the artist do in order to ‘connect’ with the viewer? They must use a variety of tools to get and hold the attention of the viewer. These tools include: composition, mark making, subject matter, involvement of the viewer in a mental process in essence to solve the picture. The subject matter and focal points within the picture will assist the artist to guide the viewer around the work, this, if successful will lead the viewer to the conclusion of the piece and hopefully will have kept their attention for more than the twenty odd seconds that is ‘normal’.